Washing towels frequently can be a tedious chore, and it uses up water and detergent, adding expense to your weekly budget. But drying your nice clean body with a bacteria-laden towel probably isn't the best idea either. So what do the experts recommend? A recent Dr. Oz poll shows there is a great mix of opinions on how long you should use a towel before washing it. Sixteen percent of respondents said they wash their towels daily, but most people stretched it out longer with 33 percent washing them two or three times per week and 40 percent just once a week. Eleven percent admitted to only washing their towels every two weeks or more. 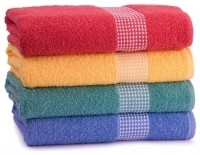 Warm, damp towels are an ideal environment for microbial growth, including bacteria, mold and yeast. Dr. Mehmet Oz and NSF International, an independent organization that checks product safety, tested 31 towels that had been used for either one, seven or 14 days. Significant amounts of bacteria were present on all of the towels tested, including those used for only one day, and significant yeast microbes were present on more than half of the towels. Mold was present on nearly half of the towels, and some even held significant amounts of E. coli. Towels, not unexpectedly, tended to get dirtier the longer they went without washing. NSF concluded that for every seven days a towel was used, the amount of microorganisms almost doubled. The study recommended using a towel for no longer than seven days, with changing it at least twice a week being preferable. While most bacteria is not dangerous, levels of E. coli found at two weeks could potentially cause a serious illness or infection if ingested, or if it comes in contact with an open wound. While it is extremely unusual to pick up a disease from your bath towel, and your own germs won't make you sick, you up your chance of disease exposure when you share towels, Reader's Digest notes. But even if you are the only one using a towel, it is good to wash them every two to three days. "When you use a towel vigorously, you scratch your skin," Chuck Gerba, a microbiology professor at the University of Arizona, told the publication. These tiny breaks can give bacteria a path into your body. Dirty towels can also increase your risk for acne. Hand towels by your sink should be swapped out every one or two days since they are used frequently and your hands may not be completely clean when you dry them, according to a report from the Today Show and Good Housekeeping. This is especially true for kitchen hand towels, which are exposed to food-borne bacteria. After using all of those nice clean towels, you won't want to sleep on dirty sheets. The Today Show recommended changing sheets and pillowcases weekly, and mattress covers and pillow liners every few months.